Last night, when we were about to retire to bed, Sangavi said, “Mama, Shall we eat raw vegan twice a week?”. I have been waiting for this moment where I can discuss with my wife about weight training, diets and explore the crazy experiments together. What else would I ask for? However, the raw vegan diet would be very tough on her at this moment. I suggested a very simple and reliable way to lose weight and gain muscle mass as well. Before I explain what this is, let’s see how our body digests and absorbs the energy from food. This is what happens when we eat food. Our body will be in “Fed State” as soon as we eat (spending time & energy to digest the food and absorb the energy). This state lasts for 3 - 5 hours. Next comes the “Post-Absorptive State”, where our body is not doing anything related to digestion or absorption. This state lasts for 8 - 12 hours after your last meal. Then comes the most attractive “Fasted State”. This is the natural fat burning state of our body, which most of us never experience. The Fasted State does not start until about 12 hours after our last meal. Assuming that dinner is your last meal and you eat an early breakfast, you would have been in fasting state for about 8 - 10 hours. So, your body would continue to be in Fed State and Post-Absorptive State forever. I guess you would have got a hint, by now. This “Intermittent Fasting” is not a diet. This just a schedule of when should you eat so that you get benefits of the natural fat burning state of your body. 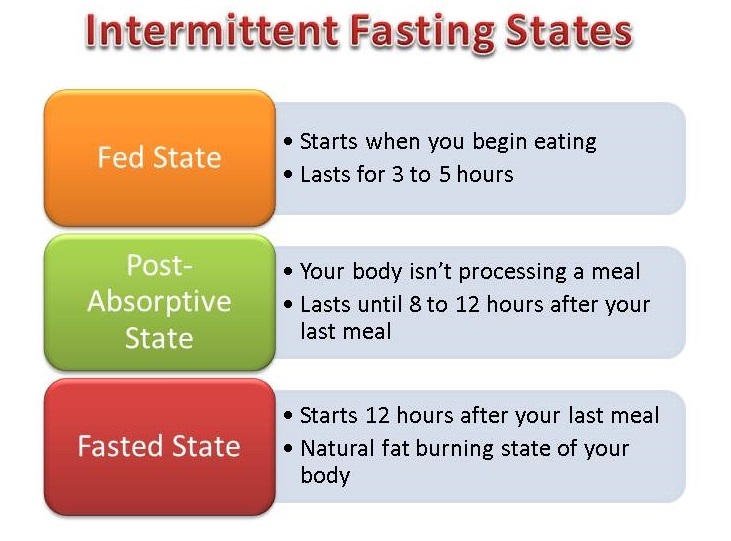 There are hundreds of ways to do Intermittent Fasting. Google it. 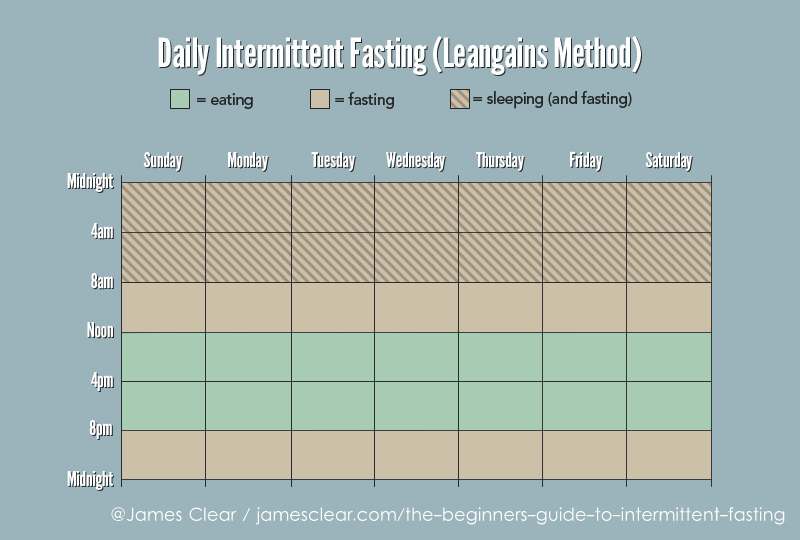 The one I am interested in is the Daily Intermittent Fasting (LeanGains Method), promoted by Martin Berkhan. In a nutshell, below is the schedule. Start your first meal about 1 PM (afternoon) and finish your meal before 9 PM (night). Essentially, your feeding window (the time you can eat) is 8 hours. You can choose your convenient time as long as it is within 8 hours. Typical IF diets include only two meals a day. Still, you can eat as many meals as you can within the feeding window. Drink a lot of water and if very hungry, you can eat any food within 50 Calories. It would be very beneficial if you do weight training during the Fasted State. It would be tiring in the beginning, but your body would adopt sooner than you think. Below diagram depicts the typical week of an intermittent fasting. 1) Skipping breakfast?. Are you nuts? I am not skipping the breakfast. I am eating a late breakfast. (i.e.) breaking the fast a little later. 2) I have the habit of drinking coffee/tea in the morning. Would that be OK? As long as it is within 50 Calories, your body continues to be in the fasted state. So, Coffee/Tea should not be a problem. I suggest drinking a lot of water. 3) Weight training while fasting? I do not have personal experience doing this. But, I know few people (Martin Berkhan, James Clear) with better bodies do this regularly. So, I am going to try this. Maybe after one or two years, I will be in a position to explain you. 4) I generally get hungry at night. What should I do? Go to bed early. Eat a heavy last meal (within that 8-hour feeding window). If you wake up, see if drinking a lot of water suffice your hunger. Otherwise, the same 50 Calorie rules apply here. It may take a while for your body to adjust to this feeding style. Anyone wants to try this Intermittent Fasting for few months?.